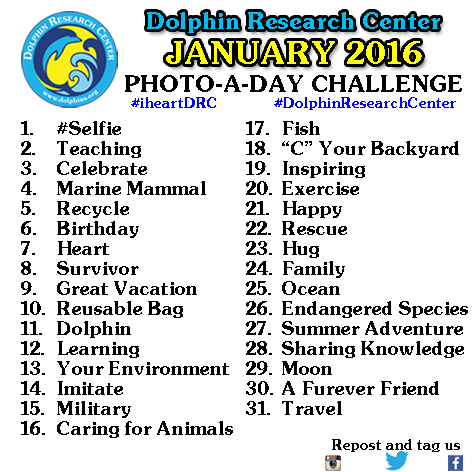 Dolphin Research Center's Photo-A-Day Challenge starts January 1, 2016! 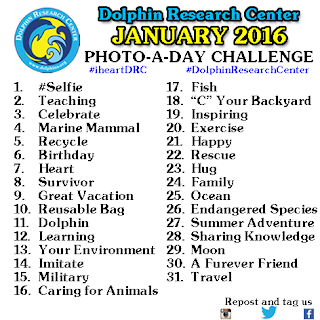 Start the new year with Dolphin Research Center by participating in our very first Photo-a-Day Challenge. To continue teaching, learning, and caring for marine mammals and the environment, we’ve created a new way for our supporters to become ambassadors for our flippered family members. The best part is that you can do it from home! The Photo-A-Day challenge starts on January 1st. There will be 31 challenges, one for each day of the month, and all you need to do is share a photo or video that relates to the daily subject on your Facebook, Twitter or Instagram pages. Use the hashtag #IHeartDRC so that everyone’s images and posts will be united! If you don’t mind us reposting your images on our social media, go ahead and also add #DolphinResearchCenter. (We’ll always credit you for the photos we repost.) Whether you use photos or video that you took while visiting DRC or creatively use something from your life at home, it will be fun to see how you connect your image to the each day’s challenge. This graphic shows you all of the challenge topics so you can start thinking about your photos. Don’t forget to post the challenge to your own pages, so we can follow your page and daily posts as well. Whether you like, follow, or gram with us online, we cannot wait for this new venture and the chance to share DRC pride with you – our fintastic fans, friends, and family. Go to our website, to learn more.